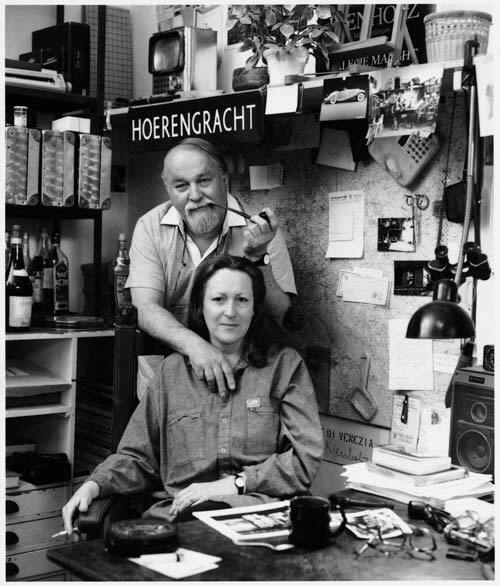 Yasmin Bilbeisi travels to London’s National Gallery to give Hi-Fructose readers a report on the provocative Kienholz: The Hoerengracht exhibit. My mother looked on in (mock) horror. The techie at the Information Desk was less ruffled. Teeming with endearing dorkiness, his headset looked like it could double as an orthodontic apparatus. He was the second to last person I’d ever have forecasted I would be engage in a search for a red light district with, my mother clearly being the last. Amplifying my discomfort was the backdrop. 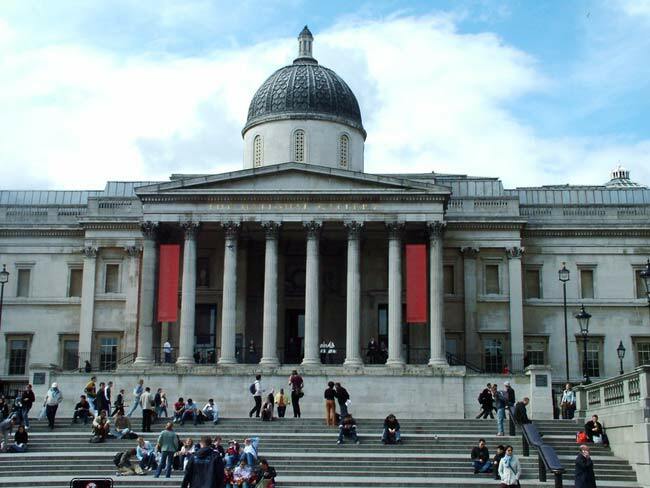 We were standing in the National Gallery (London), the most staid of the museums housing the National Collection. Perhaps had we been in the Tate modern, looking for the red light district of Amsterdam would not have felt like a clandestine act of indecency. However, I would far rather appear immoral than ignorant (particularly when faced with an INFORMATION desk), so I decided to bypass trying to pronounce, the name of the exhibit I was searching for. Why don’t you have gander, dear reader? The Kienholz: Hoerengracht. The Teutonic tongue twister catches itself in the same snag as medical jargon and Aramaic, muting even the most adventurous of polyglots. My mother quickly snapped out of faux-dissaproval, sputtering something about the “Dutch Masters” as the Techie drowned us both out with an offer of instructions. Nearing the exhibit, temptation beaconed in the form of 2,000 years of work by Old Masters and other notable painters. It seemed blasphemous to ignore them, raging towards this salacious monument to the 20th century. I already resented the installation. The cavernous rooms are arranged chronologically, reinforcing my neglect of thousands of years of art history; squandered en route to this dubious contribution from the 20th century. 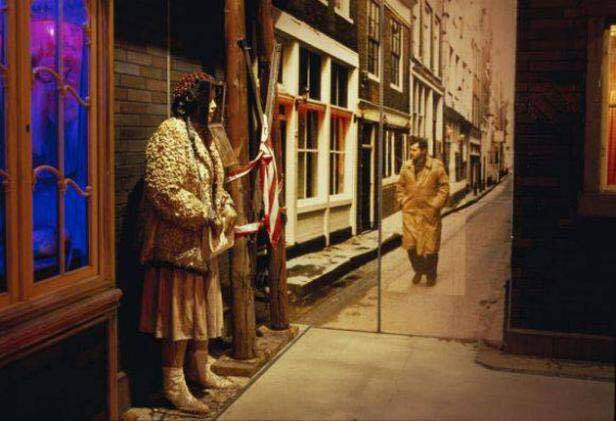 A life size replication of Amsterdam’s red light district did not seem like a worthy excuse for behaving like a philistine. Upon entering the alleged site of the exhibit, I was surprised to find a glut of visitors, embarrassedly bonking heads, clanging elbows, stooping, stretching, then see-sawing in the hopes of getting a clear vantage point. The turnout was spectacular! But they were not viewing the installation-they were studying the endless introductory text pontificating about the creators of the project. About Amsterdam. About hookers. About cookie tins (?!). About hookers in Nevada. And, I suspect, about what the stenciler’s sister’s Persian cat had for breakfast. Having just come from the dark ages next door (literally and metaphorically), I found this expository display comforting (at first). Less so when I realized the encyclopedia was chock full of largely superfluous information, easily reduced to: 1) Hoerengracht is a play on Herengracht- transforming the canal’s name from the Gentleman’s Canal to the Whore’s Canal, 2) Ed Keinholz and his wife Nancy are the husband and wife team behind the sobriquet Kienholz, 3) the installation was their magnum opus, and took several decades of construction. Despite its superannuated reputation, the National Gallery is not totally disconnected from contemporary art. Every two years, an artist is chosen to produce work based on the permanent collection. The gallery supplies them with a studio and they are given an exhibition at the end of their tenure. But this is the first installation it has shown, and, I would hazard, probably the most salacious of the modern visitors. According to the press release, the Kienholz piece was chosen for its ability to bring theme of the surrounding work into a present-day context (or, rather, a 30 year old present-day context as the piece was hardly churned out last week). The press release and other write-ups emphasized that the installation would be shown with the Dutch masters’ works, which were also a commentary on prostitution. 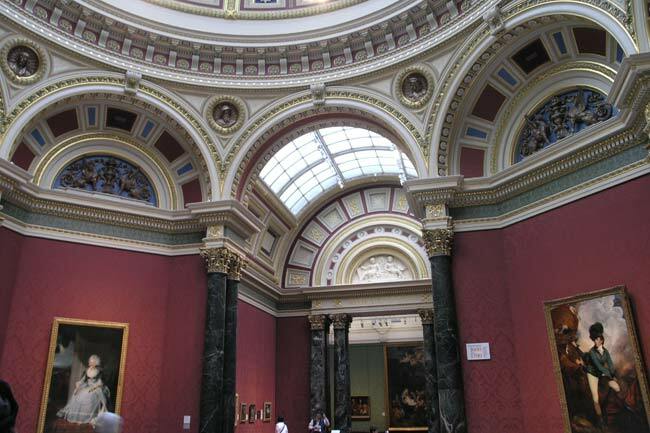 The National Gallery hoped to emphasize that common themes run through art history. Considering the adage about prostitution being “the oldest profession,” is it so shocking that the Old Master’s Paintings deal with it? It’s hardly a 20th century invention. I managed to discern a few of the aforementioned works suffocating behind the endless tomes on the walls. The advertising and write ups that I had seen misleadingly suggested to me that the works of the Old Masters were as salient and instrumental to the experience as the Kienholz piece. I was disappointed to find them so disjointed from the actual installation, not to mention overwhelmed by patronizing assertions of the blatantly obvious (it hardly takes an art history expert to discern that red indicates passion). Some of the works on display were Jan Steen’s “interior of an Inn”, Godfried Schalcken’s “A Man Offering Gold and Coins to a Girl” and Pieter de Hooch’s ” A Musical Party in a Courtyard”. Sadly, I can remember in great detail the font and the size and even the opacity of the letters indicating that these were on display, but I can’t remember much at all about the paintings themselves. It’s like the corps du ballet doing a pirouetting stampede over the prima ballerina. I excused myself from the bombardment and sought out the actual exhibit. Red lights don’t have quite the same jarring effect in full daylight, so the room was completely black. The inky darkness was arresting, both calming and utterly unanticipated. Two lampposts flickered authentically, somehow managing to convey both the glare of streetlights and the glow of moonlight. The “canal” was left to the imagination, surprisingly successfully. It did not strike me as a masterpiece, artistically, but it was done with theatre grade precision- so much that I expected a rambunctious cast of thespians to come raging out of the set. Or perhaps stampeding ballerinas? My mother lingered at the ‘canal’ and gestured to a bench well over in the inky black back of the room. I could see random flashes of white, like the spectres in cartoons. Teeth. Eyeballs. Hair. Flickering across a row of geriatrics on a bench, who clearly had not received the memo re: Amsterdam’s cameo at their beloved sanctuary of highbrow delights. They clutched their handbags fast against their chests, eying the alien structure with an mÃ©lange of contempt and fascination. The ‘canal’ allowed them to stay distanced enough to subvert any possible perversion-by-osmosis, but close enough to ogle the whole locale with the same despondent lechery a peep-show client may effuse. These seniors seemed hell-bent on conveying their separateness from the debased setting before, mimicking the real life phenomenon of people surveying red light districts from afar, trying to mask their intrigue with disapproval. The structure itself was not as big as I had expected or hoped. I was expecting a fully developed quasi-red light district- replete with 80s discos, coffee shops, and throngs of people. Instead, the edifices were kitsch reminiscences of people’s living rooms in the 70s. The bric a brac and knick-knacks in the rooms made the debauchery seem almost mundane and banal- overflowing ashtrays, chipped ornaments, peculiar looking framed photographs, and other pedestrians items abounded. 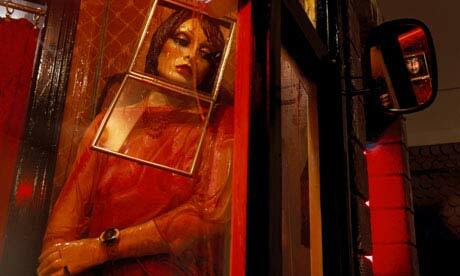 The ‘prostitutes’ looked less like mannequins and more like calcified blow up dolls. 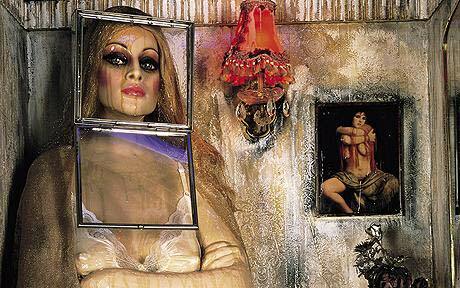 These effigies represent real women; the Kienholz had paid prostitutes 50 guilders in return for the permission to photograph their bedrooms (workspace, technically). The faces were framed by cookie tins lobbed onto the shoulders of each mannequin, emphasizing their “single-mindedness” and no-kissing policies. I would far have preferred to infer this, but unfortunately I already knew the exact nature of this “suggestion” after reading the textual assault next door. The exhibit was smaller than I had expected, leaving me aimless enough to robotically shadow an older man who looked conspicuous in his solitude. I found myself more interested in his touring of the premise than the premise itself. The shiftiness was palpable; he was so awkward in his efforts to appear inconspicuous that he drew the focus his way. I realized that I was staring at him with the same disengaged glaze as the doll he was looking at. Suddenly, he became aware of me watching him peer into a window and a prickly sludge of embarrassment descended. I could almost hear the penny drop as he remembered that he was in a simulation of the red light district, in a museum, and not caught in the throes of sordid meandering. I could sense some of the other viewers feigning utter enthrallment to obscure their familiarity with such seediness. The Hoerengracht managed to effectively invert the roles of the viewer and the art. There is something terribly exposing about gawking at the exposed. The petrified hookers glared back at the stream of patrons; a twisted instance of absolute power emanating from the powerless. The other commendable accomplishment was its ability to manipulate one’s sense of time artfully. Clearly, the juxtaposition with the antediluvian gallery surrounding it made it feel uber-modern. However, once close up to the work, it became clear that the effects and decor are decidedly passÃ©- an inevitable drawback of taking 30 odd years of construction. The aesthetic seemed to humanize the dolls and I felt a pang of sadness as I compared the hardness of their physical trappings with the tattered, outdated simplicity around them. It was hard to reconcile the two extremes. Unfortunately, I left the exhibit feeling like I had just seen a bad transplant- the difference between a seamless, aerodynamic prosthetic leg and a rusty hook precariously tethered to a gangrened arm. The gallery directors must have been aware of this, and used the placement in a room full of Dutch Masters as substantiation for the almost insolent disharmony. However, the awkwardness was to be expected and it did not override the benefit of experiencing something so novel. The Dutch Masters’ painting, as mentioned previously, all alluded to sexual transactions. 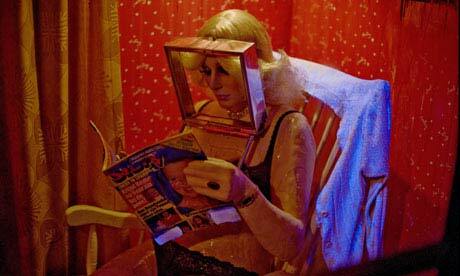 The audaciously anachronistic Kienholz piece was far less subtle in its approach. I retreated from the Kienholz: Hoerengracht eager to absorb the centuries of masterpieces I had eschewed on my way in. As effective as the piece was, it still could not outdo Titian and Ruben. However, I regret to report that, even after trawling the rest of the gallery for hours with my mother, there were no bustles of enchanted visitors whose energy or attentiveness could match those ogling the text. The National Gallery houses work by Titian, Botticelli, Caravaggio, Sergeant, Turner, and Picasso to name a few more household maestros, but I had not seen anything comparable to the hullabaloo erupting in the Salisbury room. The same gaggle of French students nonchalantly breeze past Titian’s Allegory of Prudence without so much as a nod. This, for me, was the most memorable aspect of the whole excursion.